SY-MCB802 600mm White Mirror Cabinet - Only £113.99! In stock now for just £113.99 including VAT! Hurry while stocks last! 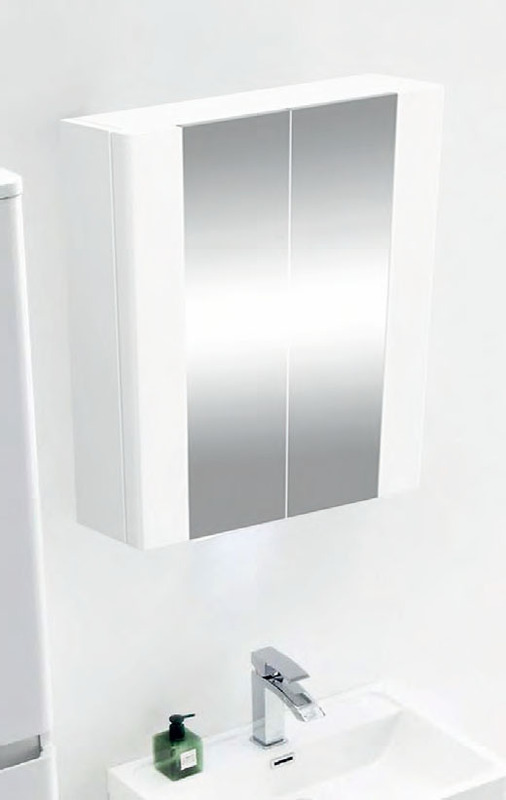 New to VIP Bathrooms is our range of superbly stylish mirrored bathroom cabinets. These six new designer cabinets are each crafted to the very highest standard and feature the very latest style innovations. All of the items in this range are bound to impress and are the perfect centrepiece for any bathroom. Thanks to the way in which these modern cabinets combine practical storage space with memorable cutting edge looks, all six items in the range have become highly popular bathroom additions throughout the UK. Make your bathroom stand out from the crowd with our new designer mirrored cabinets. The perfect way to stylishly store away all your bathroom items, a good bathroom cabinet is an essential part of any rennovation. Combining excellence in design and build quality, with the very latest styles and looks, and sold at a great value price, all the items in this range are made to impress. Why settle for a drab and dreary plain cabinet when you can add sparkle and flair to your bathroom with a designer mirrored cabinet from VIP? The mirror cabinet is manufactured to the very highest standards, and is accompanied by a superb 5 year guarantee which is a testament to the outstanding quality of this item. This superb modern mirror cabinet is available at an extremely competitive price and is of the highest quality, making it an ideal choice for any bathroom setting. Highly popular thanks to their seamless blend of superb looks and practical storage space, these high quality designer bathroom cabinet mirrors are fast becoming one of our most popular ranges. Featuring the very latest designs and styles, these cabinets would look perfect in any bathroom. Whether you're after an LED illuminated wall cabinet, aluminium cabinets ordouble door cabinets, you're bound to find the ideal match for any bathroom design.